Workshops are king. And if they’re not then they’re pretty darn close. They are a powerful way to deliver great value, while people get to know you and learn more about your products and services. And workshops can be great money makers. 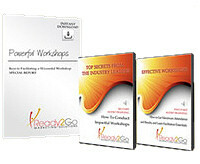 If you are delivering various workshop topics on a regular basis, you can generate a very nice income! Plus think of the clients you will gain! But you know how overwhelming it can be to put together a 2-3 hour workshop, let alone several! So we made it easy for you. No longer do you have to deal with the tedious and time consuming task of creating everything involved in marketing and facilitating a workshop. With the Ready2GoWorkshops, we took the pain out of creating a workshop, and did it all for you. All you do is customize and brand it to fit your own business needs and you’ve got a powerful business tool. Fully developed workshop with agenda, workshop flow, all necessary content, instructions, scripting, and workshop activities. Facilitation instructions for conducting a successful workshop including knowing your role, tips on how to lead a successful workshop, preparation for the workshop and an event preparation check list. Marketing guide with recommendations on how to effectively market your workshop, including logistics on how to coordinate a seamless and successful program - professionally crafted promotional correspondence included - and a marketing timeline. Follow-up plan which includes follow-up recommendations, post workshop homework, instructions for staying in touch and follow-up email. While we recognize the value of this product as a stand alone tool, we encourage you to use it with the other Ready2Go Marketing Solutions. This allows you to deliver an integrated marketing strategy that will build your list, increase attendance rates and convert more prospects to clients. Now you can save more time and make more money with your very own plug-n-play workshops that you can use time and time again!